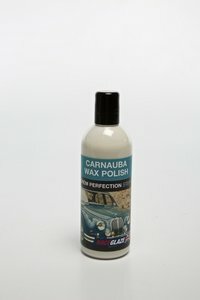 Natural Carnauba wax polish - no watery/chalky marks, dust or marks on black trim. Fills in swirls & scratches in a gentle liquid cleaning formula and gives a proven Concours-winning deep shine. Easy to use - wipe on, buff off, even leave for an hour in direct sunlight and buff off easily. Best Race Glaze selling product, lasts for 2-3 months, even outside. 500ml bottle sufficient to coat c.8 average sized cars. Ideal for Acrylic, Cellulose, Synthetic, Two pack, Lacquered, Metallic and Glassfibre gel coat paints, newer water-based soft paints and dark colours. 'The best polish I've used in 50 years' says one customer. A class-leading product from a niche provider of proven car care products. Since 1994 Crem Perfections' chalk-free, no fuss, long lasting shine has been enjoyed by thousands of hard to please car enthusiasts. With NO vices - no dust, no white marks, no abrasives, no residue, easy to apply in direct sunlight and buff off, its about the easiest product you can polish your car with. And it lasts - around 2 months on regularly used cars kept outside, providing long lasting protection against the elements and wildlife. Forget chalky abrasive products, even if you've used them for years - Crem Perfection is brilliant - we guarantee it ! "I only ordered your products the day before yesterday, and the complete order arrived a few minutes ago by AmTrak. Very impressive service. Many thanks."